Your participation directly funds the costs to help save and prevent a rhino from being killed for it’s horn. Click HERE to see the impact your participation will make. 12pm: Lunch at our Rhino Project host lodge and some time to relax. 6.30am: After a quick breakfast we embark on the Rhino Project. You will have the opportunity to be directly involved in the ear notching, tagging and medical testing process. Your participation in this expedition will help greatly to fund the infrastructure required to support our rhino rehabilitation efforts and to restore the ever dwindling rhino population numbers. 5pm: Feeding animals at the hospital, giving milk to baby Rhinos and other orphaned animals needing care. 9am: Feeding animals at the hospital, giving milk to all baby animals, not just the rhinos. • All meals, house wines, beer and spirits included at Rhino Project Partner lodge. Our Rhino Orphanage lodge offers all meals but there will be no alcohol available for liability reasons. 2) Helicopter and pilot fees to track the rhinos at risk of being poached. 3) Costs associated with ear notching and tagging the rhinos for identification and tracking purposes. 5) Lodging costs during the expedition. Joining a Rhino Project Expedition is a great way to meet new people who are inspired to travel with a positive hands-on change approach through supporting local communities, environmental and wildlife conservation efforts. Do you have over 10k followers on Instagram or Facebook? Learn how to earn a travel sponsorship to earn a free trip to South Africa to help save a rhino. Man Ex will be running privately funded Rhino Project Conservation trips in 2019 for those who want to get "hands on" with rhinos in the wild as part of our conservation efforts to protect and save more rhinos from poachers. 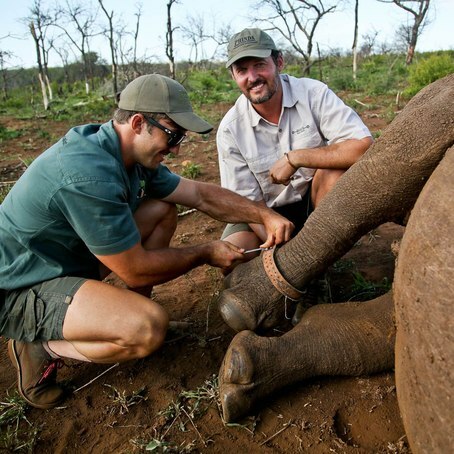 You will have the opportunity to be directly involved in the ear notching, tagging and medical testing process with our Rhino Rescue Team in South Africa. Your participation in this project will help greatly to fund the infrastructure required to support our rhino rehabilitation efforts and to restore the ever-dwindling rhino population numbers.